What’s your current teaching role? 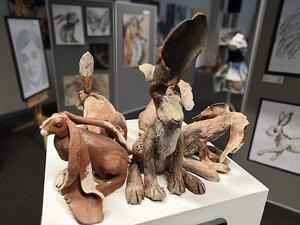 I am an art teacher at Valley Park School in Maidstone. We are a mixed secondary academy, part of an expanding trust. We are privileged to offer a scholarship scheme which attracts students with particularly strong talent in a range of creative subjects. 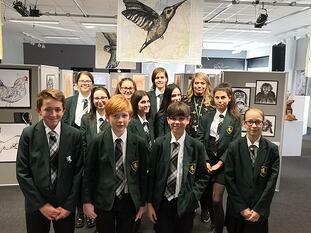 On average we have 10 students in each year group on the scheme in art, performing arts and music. 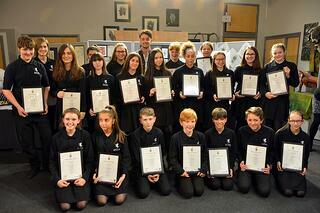 Last year I worked with 27 students on a scholarship to achieve their Bronze award. This was done as part of after-school sessions and the students were very independent in completing their work. As part of the scholarship we offered the opportunity to go on an annual arts trip and hosted visiting artists as often as possible. I’m also just starting the Silver award and in the next few weeks the students are putting on an exhibition of their work, which is really exciting for them. After this I will look to expand Arts Award beyond the scholarship scheme into other creative areas in the school. Can you tell us about your journey getting going with Arts Award? I didn’t get started straight away, as an NQT the additional training and meetings the school provided meant that I did not have enough time to organise Arts Award. However, during my NQT year, we had a department inspection by an ex-lead Ofsted officer who specialised in the arts. He strongly suggested that offering Arts Award would benefit the school and this provided me with the opportunity to put things into action. I discussed the opportunity with my Head of Department and set Arts Award as one of my personal targets for the year. With the support of SLT, we started Arts Award and registered as a centre. Currently, funding comes from a scholarship assigned budget. Had you heard about Arts Award before it was offered to you as part of your PGCE course? No, I was unaware of the award before our adviser training day. I am very thankful to my mentor for organising and providing me with such a good opportunity, which was great to have on my CV before applying for teaching jobs. The training day was scheduled into one of our university-led curriculum days. As a CPD opportunity, the adviser training day really enriched our experience and we all left feeling inspired. What’s excellent is that the training particularly makes you aware of how vast the arts are, not just our area of specialism (mine was visual art). What has been the biggest challenge getting going with Arts Award as an NQT? The biggest challenge I have faced is working on it alone. If I were to start again I would really encourage others to go on the course. Also, I would consider teaming up with other local Arts Award centres and accessing alternative funding together. The more of you there are delivering the award, the easier it gets. In what way has being an Arts Award adviser helped you to establish yourself in your full-time role as a teacher? Being the only trained adviser to start the Award in our school has enabled me to develop myself professionally by taking ahold of my own project and leading it. It also means that I have my own place in an already very successful and long-standing department. 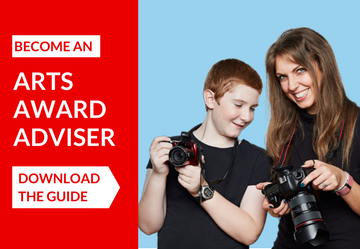 What would be your advice to other trainee teachers considering becoming Arts Award advisers? I’d say do it! It’s a fantastic opportunity and something that you can offer any potential employer. Even if you don’t use it straight away, the support from Arts Award continues with resources available. Whether you are training to be a teacher, newly qualified, or leading students on PGCE and other routes into teaching, Arts Award has a range of training options to suit you. Find out more about how you can get started on your Arts Award journey.